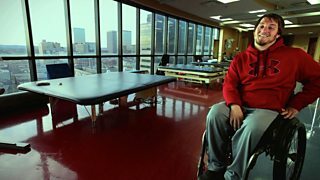 BBC Two - Trust Me, I'm a Doctor, Series 2, Episode 1 - Could the paralysed stand again, with just a tiny electronic implant? Dr Susan Harkema tells Gabriel Weston about the extraordinary results of her research. Surgeon Gabriel Weston travels to Kentucky to find out about pioneering research that’s helping people with spinal injuries to stand again. 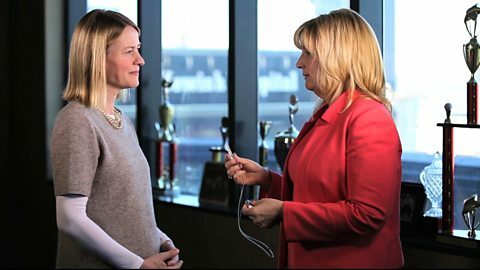 The ground-breaking clinical trial is led by Dr Susan Harkema at the University of Louisville and has already produced remarkable, and completely unexpected, results. Five years ago, 21 year old Kent Stephenson from Texas was practising for a motorcross event when his bike locked up in mid-air. His spine was so severely damaged that he was paralysed from the chest down. Doctors told him he would never regain movement and would need care for the rest of his life. Two years after his accident, Kent was selected to take part in Dr Harkema’s trial. After months of intensive physical therapy, a small electrical implant was inserted into his spine, below the area of damage. The aim was to try to stimulate the nerves below the injury to try and make them active again. Prof Harkema developed this technique to test a theory she had which went against mainstream medical thinking. In other species, the spinal cord is very sophisticated and often controls locomotion. But it was thought that the spinal cord in humans lost this ability when humans evolved their sophisticated brains. By implanting this standard electrical chip (originally designed simply as a pain control device) below the site of the injury, Prof Harkema wanted to see if the spinal cord could maintain some function. It turned out that it could. Remarkably, simple electrical stimulation of the nerves below the break could made them work again. These newly functioning nerves could help support paralysed patients once they’d pulled themselves into a standing position. Dr Harkema’s first patient had some feeling in his legs before the implant, so she took Kent on as a second patient as his break was complete – he had no sensations below the site of his spinal injury. They expected that the technique wouldn’t work as well for him, and yet, once he had the implant, the results were the same. As well as allowing him to stand unaided, it’s given Kent back many of the other functions that are lost as a result of such an injury, such as bowel and bladder control, even when the stimulator is switched off. 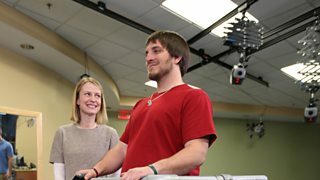 More extraordinarily, the first time it was switched on, the implant allowed Kent to do something that none of the researchers thought possible: he can now voluntarily move his legs. The stimulator is somehow allowing what must be tiny signals from his brain to get through to his legs and control his muscles, despite the damage further up in his spinal cord. He can move his ankles and his legs individually at will. Dr Harkema’s team saw the same results with all four of their patients who like Kent were suffering from paralysis and agreed to have electronic chips implanted in their spines. This research is causing a radical rethink of how patients with spinal injuries should be treated, and what their future may hold.